The Hook: Can I really make money by doing what I love doing? When I first set up my blog, I didn’t do it for money. And I know everyone says that, so I’m sure I’m preaching to the choir, but seriously, the purpose of my blog was just to do what I love doing–writing–and gaining confidence by putting it out there on the Internet. But what if I could make some money doing what I love to do? Is it possible? I mean, I’m sure it’s possible. Look at how many people are doing it today. But could I do it. And if I could do it, how do I begin? 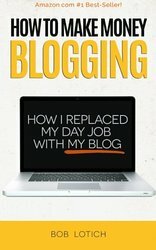 Bob Lotich is straight-forward in his book, How to Make Money Blogging. I can’t tell you how many books I’ve flipped through, how many web articles I’ve read, and how many suggestions I’ve heard through this blogging adventure of mine. I never considered writing as a career growing up, or writing for some cash period. I mean, sure … okay, off topic here. Let me reel it back in. What I liked about Loitch’s book, what made me read from cover to cover, was that he stuck to exactly what he said he was going to do: how to make money. Out of all the blogging books I picked up or articles I browsed through, he didn’t start by saying “first, you need to have a passion of writing” or “you need to write good stuff.” I know that this is important. Your writing has to be good, or at the very least consistent. And I know I need to have a passion for writing in order for me to go through with this. I understand this. And if I want to learn how to write better content, I’d pick up a book that says How to Write Good Content or the like. I don’t want to read two or three chapters on writing good content when I want to learn how my blog can make money. Secondly, his format was simple and easy to follow. He tells you what he did and makes suggestions as to what you could do, even if he did it differently. I like that he gives you options. And he’s honest about things he hasn’t tried, but heard they worked for others. There’s a balance to his writing that I liked. In fact, the steps he suggested made immediate sense to me and I started to apply some of his suggestions even before I finished reading. This book accomplished what it set out to do. It taught me how my blog could make money if I want it to. In addition to that, he tells us about his experience taking this route and even answers the question of how long will it take for your blog to generate some type of income. I say this is worth a read and I’m glad to have it in my reference library. The links he provides for additional information is a tremendous help. Now, I’m not sure if I’m going to go in this direction and make money off of blogging, but I like knowing how to if I decide I want to proceed. And if I decide to see if I can make at least some money doing what I like doing, I like know the different routes to get there. And this book tells me how to do that.